Ask your customer support heroes to list down their productivity killers, and we bet that this one will definitely make it to the list - leaping from one tab to the next, in order to gather the necessary information to address a customer's query. And we've come up with just the right solution. 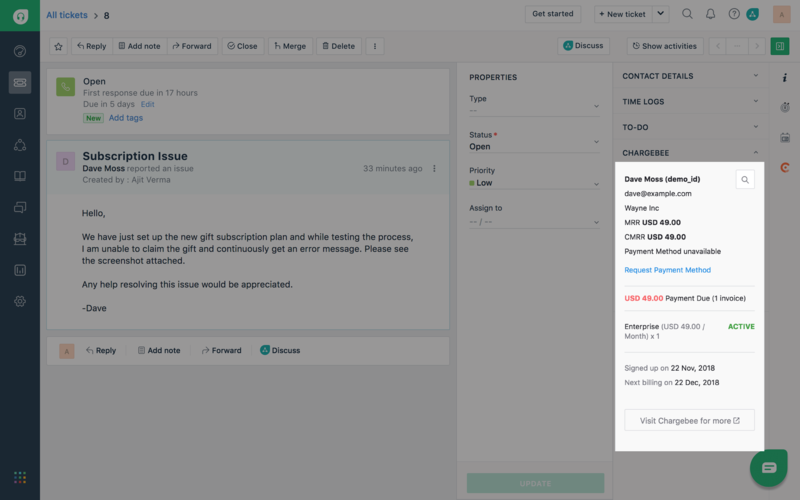 With the Chargebee Freshplug installed, you'll have all the subscription details of the particular customer neatly displayed right next to the corresponding support ticket on the Freshdesk app. No more tab juggling. Focus on your customer with no distractions whatsoever. Follow the steps here to get started with the integration. The Chargebee - Freshdesk integration is available only Chargebee's Scale plan and above. Freshdesk makes customer happiness refreshingly easy, by enabling you to deliver exceptional customer service. View all the basic details of the corresponding customer in the Chargebee widget - including Addons, MRR, and CMRR (for upselling); Payment Due invoices and amount; specified Payment Method, etc. You can also use the "Request Payment Method" option to send an email to the customer with a link to update/add one. 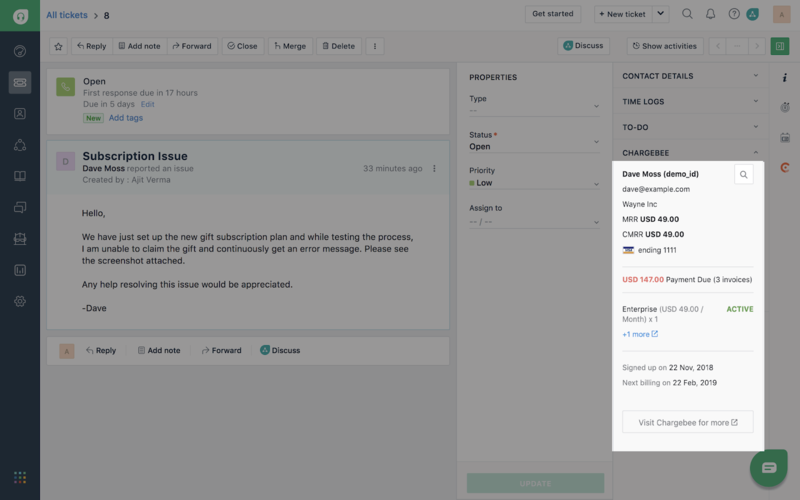 If a customer has multiple subscriptions, you can view the MRR and CMRR of all their subscriptions side by side. Want to view more details about the subscriptions? Click the "For more, visit Chargebee" to jump to the respective Customer details page directly. 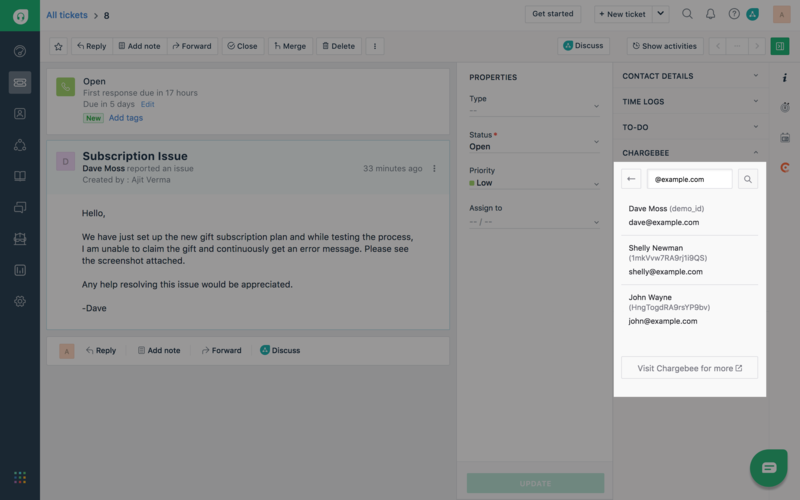 It's not fair on our part to expect the customer to always raise a support ticket with the same email address, with which they had created the subscription. And that's why Chargebee also uses a domain-based search to fetch and display all the subscriptions that belong to the particular domain. Visit Freshdesk to learn more about setting up this integration.